On a sweltering July 7, 1865, a mere 12 weeks after Abraham Lincoln was shot at Ford’s Theater, four of his assassin’s accomplices were hanged in the courtyard of the District of Columbia’s Washington Arsenal — present-day Fort McNair, and specifically its tennis courts. 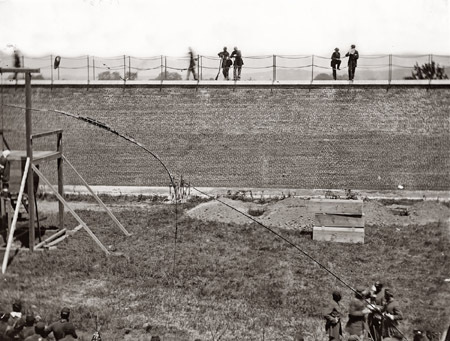 The exact nature of the conspiracy against the man who had seen the North to victory in the Civil War has been debated ever since actor John Wilkes Booth lodged a ball from his one-shot Derringer behind Honest Abe’s ear. But it was a conspiracy — an astoundingly bold one. Simultaneous with Booth’s successful attack upon Lincoln, there was an unsuccessful attempt to kill Secretary of State William Seward; it would emerge in the investigation that another man had been detailed to murder Vice President Andrew Johnson, but got drunk and chickened out. The apparent upshot: with the President and Vice President dead, new national elections would be required to replace the Senator who would become acting president — and with the Secretary of State dead too, there’d be nobody to implement them. Booth was trying to paralyze the North with its own constitutional machinery in some desperate hope of reviving the defeated South. Hundreds were detained in the stunning assassination’s immediate aftermath, but ten would ultimately be the federals’ targets. A massive manhunt pursued Booth through southern Maryland and into Virginia, where he was killed in a shootout. John Surratt, who had conspired with Booth in an earlier plot to kidnap the president — that failed plot had been reconfigured into the assassination — escaped from the country. The other eight were rounded up and stashed at the Arsenal to face a military tribunal. It was a highly controversial arrangement: the war had entered a gray area — Robert E. Lee’s surrender just days before the murder had effectively ended the war, but when the trial opened in May Confederate President Jefferson Davis was still at large, and the last Southern general wouldn’t lay down his arms until late June. The District of Columbia was still technically under martial law … so would it do to use a military court? So the government asked itself: government, would you rather have looser evidentiary rules and a lower bar of conviction than you would have in civil court? The government duly produced for the government an opinion that the military characteristic of the assassination — that is, to help whatever southern war effort still obtained — licensed the government to use the military courts. If the offenders are done to death by that tribunal, however truly guilty, they will pass for martyrs with half the world. Indeed, a year later, the Supreme Court’s landmark ex parte Milligan ruling would forbid the use of military courts where civilian courts are open — which they were in Washington, D.C.
That, of course, was too late to help Booth’s comrades. It would be a military trial, with a majority vote needed for conviction and no right of appeal but to the president for the most infamous crime of the Republic. Everyone had a pretty good idea what the results would be. 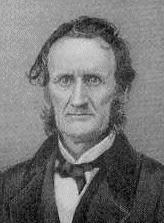 Two of the four today were doomed from the outset under any juridical arrangement imaginable: Lewis Powell (also known as Lewis Paine or Lewis Payne) had made the attempt on Secretary of State Seward; David Herold had guided him there with the getaway horse, and later escaped along with Booth. They were in way past their eyeballs. George Atzerodt, the schmo who couldn’t rise to the occasion of popping Andrew Johnson, looks a bit more peripheral from the distance of a century and a half, but in the weeks following the assassination he was much too close to the action to have any hope. 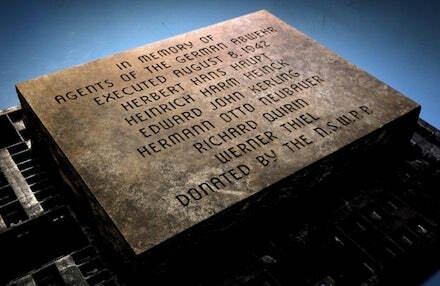 All received death sentences. 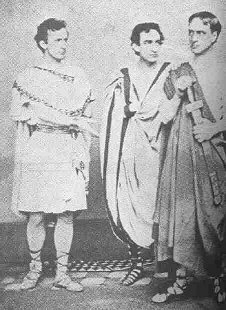 Two others — Michael O’Laughlen and Samuel Arnold — had been involved in Booth’s earlier scheme to kidnap the president, but didn’t seem to have much to do with the murder. Still another two — Ned Spangler and Dr. Samuel Mudd* — were lesser participants. They all received long prison sentences for their pains, and the three of them still surviving were pardoned by Andrew Johnson as he left the presidency in 1869. The conspirators met frequently in her lodgings; Surratt maintained her innocence beyond that, but evidence and witness testimony began to pile up heavily against her … especially when Seward assailant Lewis Powell wandered into her place looking for refuge right while the police were questioning her. Booth and Herold turned out to have made a pit stop at her Surrattsville tavern to pick up a package of guns that Mary had prepared for them. 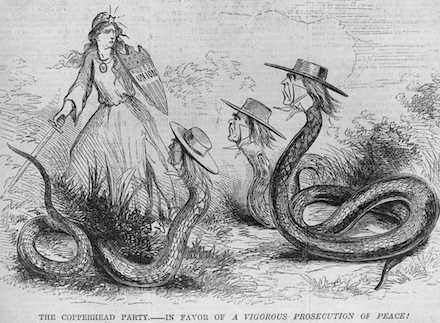 I, Andrew Johnson, President of the United States do hereby declare that the writ of habeas corpus had been heretofore suspended in such cases as this; and I do hereby specially-suspend this writ, and direct that you proceed to execute the order heretofore given upon the judgment of the Military Commission. Harsh treatment, and possibly well-deserved, for the first woman executed by the U.S. government. 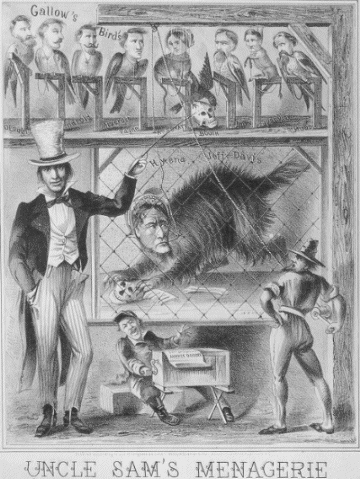 Even so, it does seem a curious thing when all is said and done that the mother of “the nest that hatched the egg” was worth a special suspension of the Great Writ, and even the stagehand who just held Booth’s horse for him caught six years, but old Jeff Davis — who apart from having figureheaded a treasonous four-year insurrection was implicated for giving Booth’s kidnapping plot official Confederate sanction — got to retire to write his memoirs. 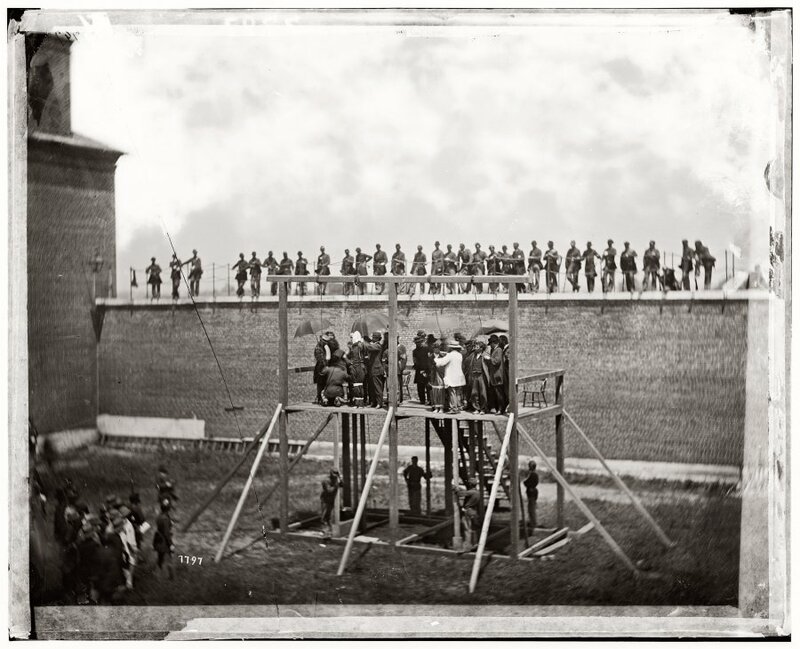 Fine pages on the Lincoln assassination are here, here and here. There are also contemporary newspaper accounts posted online as filed for The Boston Post and The New York Herald. The Surratt houses, by the way, are still standing. 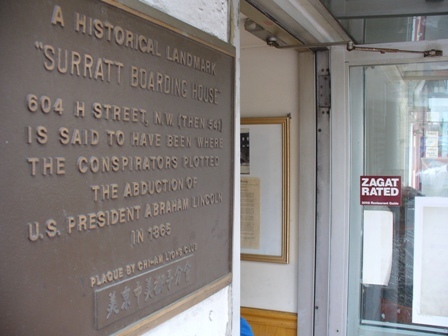 The Maryland tavern is kept as the Surratt House Museum by the Surratt Society. 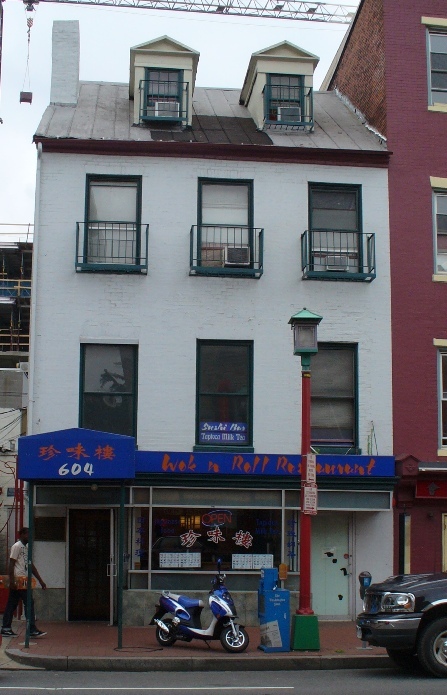 The downtown boarding house is a Chinese restaurant … marked with a plaque remembering more momentous doings than bubble tea. 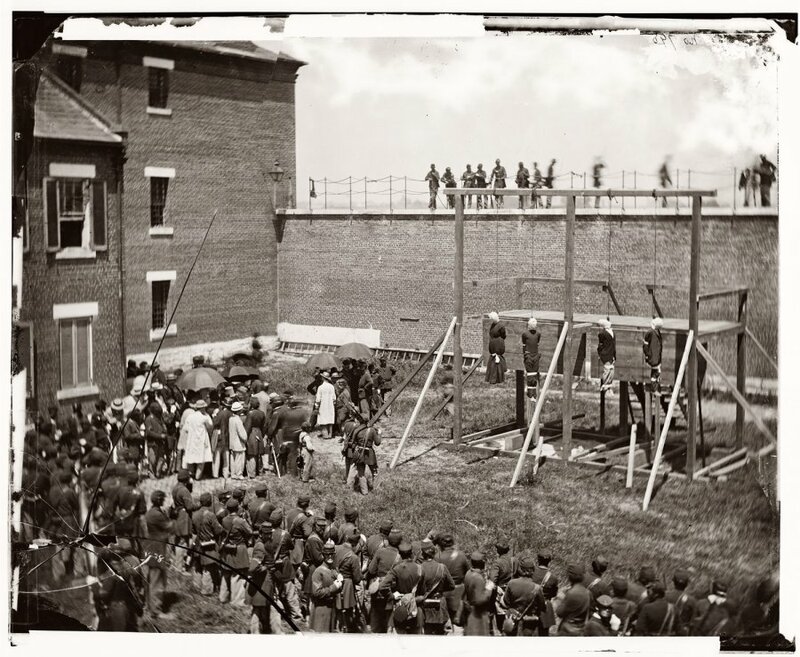 * The panel voted 5-4 to hang Mudd, a Maryland doctor who not only set the leg Booth broke when he leaped onto the stage after shooting Lincoln, but then misdirected Booth’s pursuers. 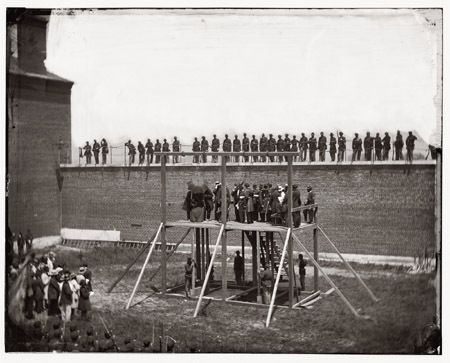 However, the rules for the trial said a two-thirds majority was required for execution. ** They changed the name after the unpleasantness. Today, it’s Clinton, Maryland.